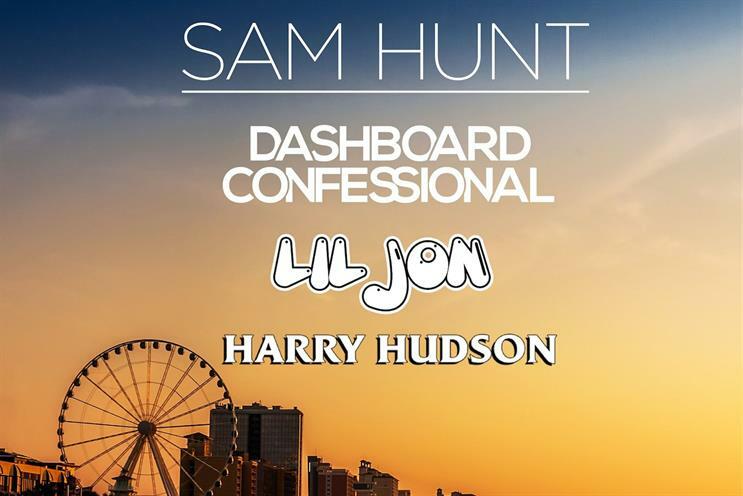 Bud Light, the lager brand, is creating a one-day summer music festival in South Carolina featuring Sam Hunt, Lil Jon, Dashboard Confessional and Harry Hudson. Bud Light Getaway will welcome 3,000 people on Myrtle Beach. It will also have a mobile brewery, a "Stitch shop" selling festival merchandise, a "Dive bar" pop-up for intimate music performances, and a "Citrus summer lounge" which will serve Bud Light Lime and Bud Light Orange. Andy Goeler, vice president for Bud Light, said: "Summer is the perfect time to kick back, hit the beach, hang with friends and listen to some great music. That's what our Getaways programme is all about." The event takes place on 14 July.